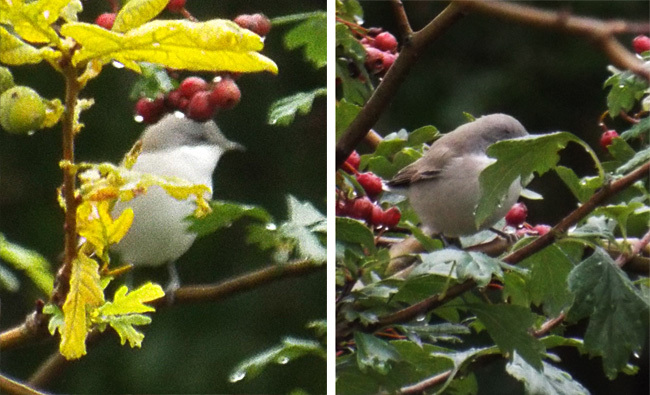 The Lesser Whitethroat is perhaps the most difficult to see species relative to how common it is - it is perhaps the most skulking of the widespread warblers of the UK, much easier to hear than it is to see with it's vaguely belligerent harsh sounding repeated "jut" sounds. It also suffers from being similar to the related common whitethroat, there are some features which can be used to separate it out - dark coloured legs, a pale "milky" breast (rather than pinkish), a dark mask (rather than a uniformly grey head) and a cool brown back (rather than warm russet). I'd actually seen this species a couple of times prior to finally managing to photograph it, generally glimpses before vanishing into a thicket. However, while in Alexandra Park in Autumn I ended up getting easily identifiable views on several occasions throughout the morning - this could tie into the fact that as their migration approaches they apparently are less skulking.